The Jazz machine from Baby Lock has a special promotion running August – September. Purchase the Jazz and receive a “free” trolley bag. What is the Jazz. 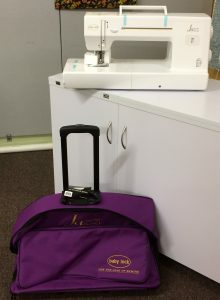 It’s an awesome workhorse that has an extended throat area for quilting and 21 various stitches so you are able to piece, repair heavy items and machine applique. I have one in the shop that you can see first hand how the Jazz performs. Stop in and take a test drive. And not only do you receive the “free trolley” but I’m jazzing up the pot some more with including the table extension! Need a travel bag…..we’ve having a class and making this great traveler using the Open Wide pattern from Annie. The pattern has instructions for 3 various sizes bags. This is the largest. If you would like to do a smaller bag, not a problem, you select the size you wish to make. You may also select your own fabrics to use. Class is scheduled for September 12th (Tuesday). Call the shop to sign up. The foliage in the woods is beginning to turn and we saw our first red maple leaf….Fall isn’t here yet, but it’s not to early to button down the dates you will be hopping on the Falling Leaves Shop Hop which runs September 29th – October 7th. Seven great shops to visit and each shop will be giving you a “free”, fat quarter. All fat quarters you receive blend together to make a wonderful quilt and you will receive the pattern when you complete the hop. Mine is completed and on display. 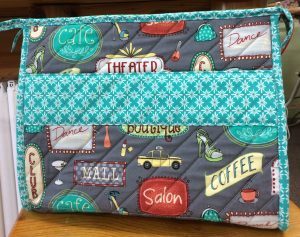 All shops will have their own finishing kit for the project and will also have a pattern and kits for a smaller project using the fat quarters you receive. Smaller kits I’m still working on, but if you would like the finishing kit from Thimbles please call and reserve your kit as quantity is limited. Enjoy the week and I still have one Tiara left. It’s on display at the shop. Set her up in 10 minutes and you’ll be quilting!